The Community Folk Art Center will host an evening with critically acclaimed musician Daniel Roumain on Friday, Oct. 18, at 7 p.m. The concert titled, “Hear Haiti Here,” will be held as part of the center’s concert series A Journey Through Music of the African Diaspora (JMAD). Daniel Bernard Roumain is a classically trained violinist and composer whose contemporary compositions have been lauded by critics, fellow musicians and audiences worldwide. 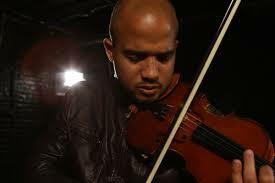 Roumain earned his undergraduate degree from Vanderbilt University’s Blair School of Music, and received his doctorate in musical composition from the University of Michigan. Roumain’s celebrated career began with his debut at Carnegie Hall in 2000, where he appeared with the American Composers Orchestra to perform his Harlem Essay for Orchestra, a Whitaker commission. Roumain went on to compose works for an array of illustrious orchestra and chamber ensembles, which include the Albany Symphony, the Boston Pops Orchestra, the Dogs of Desire Ensemble, the Library of Congress and the Stuttgart Symphony. He has since been commissioned by artists that span the musical spectrum, including Phillip Glass, Cassandra Wilson, Bill T. Jones, Savion Glover and Lady Gaga. JMAD, now in its third year, explores and celebrates the rich creativity, depth and legacy of African diaspora musical traditions played by local, regional and nationally recognized musicians, with support from Syracuse University, The Gifford Foundation and Third Thursday (TH3). This event is free and open to the public, and donations are welcome to support the center’s education programming.